DRACULA’S GUEST picks up Dracula’s story shortly after the conclusion of DRACUL, the iconic prequel to DRACULA written by J.D. Barker and Dacre Stoker. 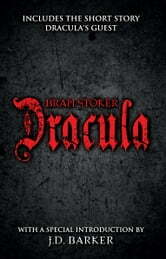 This is followed by the original text of DRACULA—both stories together again as Bram Stoker originally intended. Famous for introducing the character of the vampire Count Dracula, DRACULA tells the story of counts attempt to move from Transylvania to England so he may find new blood and spread the undead curse, and the battle between Dracula and a small group of men and women led by Professor Abraham Van Helsing. 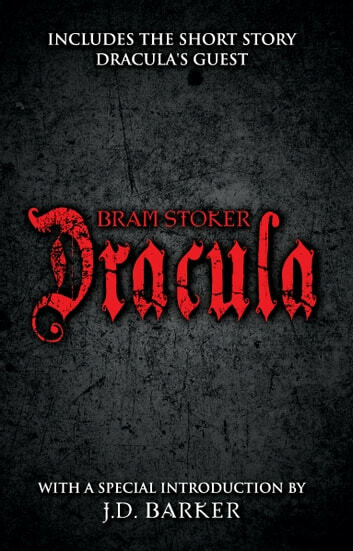 DRACULA has been assigned to many literary genres including vampire literature, horror fiction, the gothic novel and invasion literature. Although Stoker did not invent the vampire, he defined its modern form, and the novel has spawned numerous theatrical, film and television interpretations. DRACULA begins with Jonathan Harker, a newly qualified English solicitor, visiting Count Dracula in the Carpathian Mountains on the border of Transylvania, Bukovina, and Moldavia, to provide legal support for a real estate transaction overseen by Harker's employer. At first enticed by Dracula's gracious manners, Harker soon realizes that he is Dracula's prisoner. Wandering the Count's castle against Dracula's admonition, Harker encounters three female vampires, called "the sisters", from whom he is rescued by Dracula. After the preparations are made, Dracula leaves Transylvania and abandons Harker to the sisters. Harker barely escapes from the castle with his life . . .
J.D. Barker is the internationally best-selling author of numerous novels including THE FOURTH MONKEY, FORSAKEN and DRACUL (with Dacre Stoker). As a finalist for the Bram Stoker Award and winner of the New Apple Medalist Award, his work has been compared to Stephen King, Dean Koontz, and Thomas Harris. His novels have been translated into numerous languages and optioned for both film and television. Barker currently resides in Pennsylvania with his wife, Dayna, and his daughter, Ember.